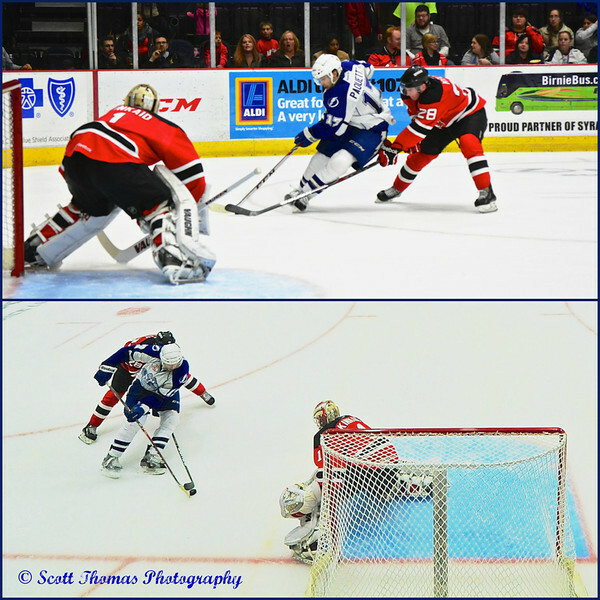 A fellow photographer let me borrow a couple of PocketWizard Plus III Transceivers for a recent Syracuse Crunch game. I placed one transceiver on the camera I was using and one on another camera I placed over one of the goals. I attached a cable from the PocketWizard to the remote camera’s 10-pin Remote Terminal and placed both transceivers on the same channel. This setup would trip the remote camera’s shutter whenever I pressed the shutter on the camera I was using. Syracuse Crunch Cedric Paquette (17) closing in on Albany Devils goal while being checked by Dan Kelly (28) in American Hockey League (AHL) action at the Onondaga County War Memorial on Saturday, November 16, 2013. This was accomplished by the use of PocketWizard transceivers allowing the action to be photographed at the same time from two different positions by the same photographer. See text for explanation. Even though I pressed my shutter hundreds of times that night, I only got 25 photos taken on the remote camera. Of those, the two photos posted here is the best example of what I was shooting for (pun intended). This experiment proved the concept works and I need to read more about these remotes to get them to work all the time. This entry was posted in Photography, Sports and tagged ahl, albany, american hockey league, camera, crunch, devils, ice hockey, new york, nikon D700, plus III transceiver, pocket wizard, remote, syracuse, tokina 11-16mm. Bookmark the permalink.